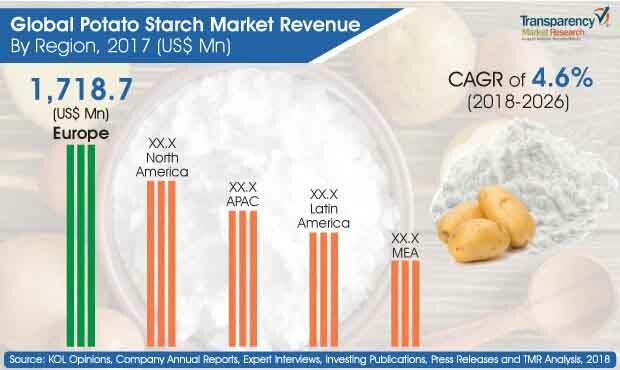 According to the latest market report published by Transparency Market Research titled “Potato Starch Market’: Global Industry Analysis and Forecast 2018-2026”, the revenue generated from potato starch market has been estimated to be valued over US$ 5,000 Mn by 2018 end, which is projected to increase at a CAGR of 4.6% during the forecast period (2018-2026). The global textile industry is expected to witness significant growth during the forecast period, especially in emerging markets such as China and India. This, in turn, is expected to increase the consumption of potato starch, primarily for textile sizing, and make a profound positive impact on the growth of the market. Moreover, potato starch, being relatively cost-effective when compared to other alternatives, is anticipated to continue gaining higher traction in coming years. By type, the global potato starch market is segmented as modified and native. By nature, the market is segmented into organic and conventional. Based on the end-use, the potato market is segmented into food industry, textile industry, paper industry, pharmaceuticals, personal care and others. On the basis of distribution channel, the market is classified as direct and indirect. The indirect channel segment is further divided into store-based retailing and online retailing. By region, the market in Europe is anticipated to dominate the global potato starch market both in terms of value and volume in 2018. North America is expected to gain a significant market share in revenue terms by 2026 end. This trend is attributed to the consumer dependence on Potato Starch as demand for convenience food is growing in this regions. Moreover, BENELUX is projected to exhibit significant CAGR in terms of value during the forecast period. Some of the major companies operating in the global Potato Starch market are Emsland Group, Cargill, Inc. , SÜDSTÄRKE GMBH, PEPEES Group, Ingredion, Novidon, Avebe, AGRANA Beteiligungs-AG,Tereos, AKV Langholt, Finnamyl Ltd, Roquette, Škrobárny Pelh?imov ,Manitoba Starch, Vimal PPCE, ALOJA-STARKELSEN ,Lyckeby, PPZ Trzemeszno Sp., Siddharth Starch Pvt. Ltd.